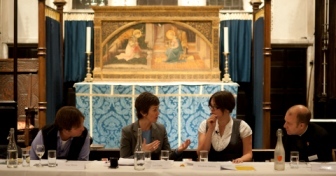 Things Unseen was launched at Southwark Cathedral on 17th October 2013, with this panel discussion looking at the findings of new research specially commissioned from the think tank, Theos. Chaired by Jane Little, the Things Unseen panel included The Very Revd Andrew Nunn, Dean of Southwark; Elizabeth Oldfield, Director of Theos; Gordon Lynch, Professor of Modern Theology at the University of Kent; and Tony Morris, a writer on Buddhism. The research showed that spiritual beliefs are found among a substantial proportion of people in Britain who do not define themselves as religious, confirming that the British have not become a nation of atheists or materialists. More than half of all people believe that spiritual forces can influence human thoughts or events in the world. For the full research results, take a look at the Theos report.